LEAF is proud to offer individualized counseling services to small businesses in the Boston area, free of charge. The L-TAP is funded by an agreement with the US Small Business Administration (SBA), an award from Wells Fargo's Diverse Community Capital Program, and various smaller partnerships. Why is it worthwhile to provide technical assistance to small businesses? First, small businesses reduce income inequality. Large firms contribute to inequality as the increase in profit margins offered by economies of scale mainly goes to the executives. Small businesses, especially ones with a cooperative business model, help lift up residents of underdeveloped areas and tend to stay local. Second, they are endangered. 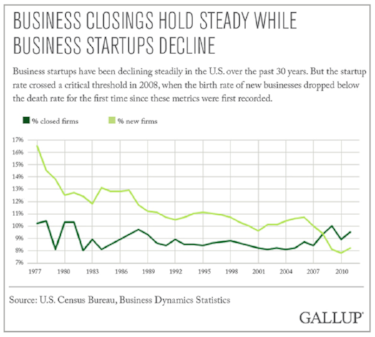 2008 marked the first time business closings outnumbered startups since records began, as a consistent decline in startups was accentuated by the financial crisis. Third, technical assistance is useful to small businesses. Proving this seemingly self-evident statement is harder than it seems, and recent progress in entrepreneurship research is lacking. One study found that easily quantifiable effects of technical assistance like increases in profit margins, number of employees, and market share, are proportional to firm size (Figure 1). This would suggest TA is worthwhile only for large firms. 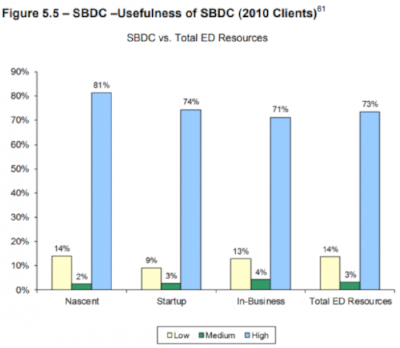 Yet a 3-year study by the SBA, based largely on surveys, found that nascent small businesses were most likely to rate TA useful (Figure 5.5 reproduced below). A safe conclusion is that TA provides more intangible benefits to microentrepreneurs, like increasing their longevity or allowing them to design a business plan before they ever start making sales. But statistics can only tell so much. Read about how LEAF's services help Boston microentrepreneurs. Or try it out: if you're a current or prospective small business owner near Boston, please fill out our free TA sign-up form! In Los Angeles’s South Figueroa Corridor, we find a thriving testament to the power of consulting and technical assistance to create lasting positive change in communities suffering from disinvestment. Mercado La Paloma was born in 2001 after a 5-year period of research and community engagement by nonprofit Esperanza Community Housing. It is an old garment-factory-turned-multifunctional-community-gathering-space, incubating shops and restaurants representing various Mexican, Thai, and Ethiopian cultures. Through its nonprofit offices on the second floor, the Mercado provides start-up capital and technical assistance to businesses, including the ones housed inside. The author attests to the deliciousness of the food, diversity of culture, and consistency of community engagement. The vegan Ethiopian options provided by Azla and mole on chicken from Oaxa, California were personal favorites. One September Sunday there was a lively Mexican cultural festival in the parking lot with live music and beautiful costumes. Hats off to Esperanza and residents of the area for supporting and maintaining the project.